The Pittsburgh Vintage Grand Prix's mission is to produce a world-class vintage racing event in order to raise funds to help provide residential care, treatment and support for developmentally disabled individuals in the Pittsburgh region. Because of the generous support and contributions from their sponsors, and the dedication of the volunteers, they have been able to donate $3.2 million to two deserving charities: the Autism Society of Pittsburgh and Allegheny Valley School. In 2013 the PVGP celebrated thei 31st annual event. Many volunteers never imagined they would get to this point, but they are still here making it all happen each July. It's a testament to the dedication of the volunteers and the allure of the Grand Prix. Though the first PVGP race was in 1983, the organization actually started the year prior. Art McGovern and Mary Beth Gmitter envisioned the city streets winding through Schenley Park in as a perfect venue for vintage auto racing. Told that City of Pittsburgh approval hinged on assurance that any money raised would go to charity, they first approached Myron Cope of WTAE-TV Sports fame – also an autism awareness advocate. Meetings with the city's parks people followed and then-Mayor Richard Caliguiri gave his enthusiastic approval. 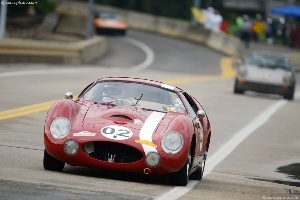 The Pittsburgh Vintage Grand Prix Association was created, consisting of volunteers, and net proceeds would be donated to two charities, the Autism Society of Pittsburgh and the Allegheny Valley School. In April, 1983, during a meeting in vintage racer Alan Patterson's Shadyside garage, the planning began for the first Pittsburgh Vintage Grand Prix, scheduled for Labor Day of that same year. An incredible amount of work ensued thanks to the volunteers from the Sports Car Club of America and the Vintage Sports Car Club of America. Some 75 entrants raced on what would become known as one of the most challenging vintage courses in the country. Five races, along with a parade of patrons, were scheduled, and the plan was put in motion. The complications of a temporary track in the middle of one of Pittsburgh's most popular public parks reared their heads almost immediately. Huge fence gaps and the labyrinth of infield trails left the course open to penetration from above and below. Recreational joggers were running with the cars zooming around the track. The volunteer security struggled mightily to overcome these logistical challenges. Nonetheless, the event was regarded as a great success. The experience only fueled the imaginations and motivations, and in 1984 the expansion began. They added an invitational car show and the Sunday tailgate known as Patron Parking. By 1985, the spectator count grew to 40,000 and included participants and fans from all over North America as well as Europe. The genesis of Race Week, in 1987, was ushered in with the first Kick-Off Rallye the preceding Sunday. The volunteer army grew by leaps and bounds and by 1989 they reached 1,000 volunteers – many of whom still volunteer to this day. Car shows in Shadyside, Downtown and Squirrel Hill filled in the Race Week gaps as demand grew. A black tie gala was added in 1998, and a Thunder Run Motorcycle event in 2001, where all entry fees went to the charities. Race Week spectator draw has consistently grown throughout the years and is now estimated at close to a quarter-million. With the added size came added attention – from Pittsburgh and beyond. In 1996, Buick signed on as our first Presenting Sponsor. They also brought new models and concept cars to the event, and helped legitimize our stature within the auto industry. Modern race cars from the Indy 500, Le Mans, and elsewhere have blasted down the Boulevard of the Allies and snaked between Serpentine's stone walls. Ferrari, Marque of the Year in 1993, showed up with museum-piece cars and actually put them on the track – in the rain. In 1994, Marque of the Year one-upmanship began as each attempted to better the proceeding's donations and spectacle. The gauntlet, first thrown down by Porsche, has been eagerly picked up by Mercedes, MINI, Jaguar and others since then. Shop ‘n Save's stewardship as Presenting Sponsor in 2001 – brought still more charity donations, an added marketing channel through its stores and a true partnership between benefactor and beneficiary. In 2004 a second weekend of racing was added at BeaveRun Motorsport Complex (now known as PIRC) and it has developed into a self supportive historic racing event. In 2009 they surpassed the $2.5 million donation mark, and are now the longest-continually-running vintage road race in the nation, with an ever-widening national and international recognition as one of the premier vintage motorsports events. 2012 was a watermark year as the PVGP celebrated their 30th consecutive year and raised a record $250,000 for charity. All the while, they have held true to their mission – To maintain a world-class racing event that is free to the public to give all money to our two charities. It has been a quarter century since a cadre of car nuts met in Alan Patterson's Shadyside garage, and each year brings its challenges. But, with the undying dedication of the volunteers and the enthusiasm of the racers, car show participants, sponsors, and spectators, and encouragement from the charities, they continue to grow and remain the nation's largest vintage sports car racing event….and the only one run on city streets.